Hello fellow Quepolandia readers! Its Karma Casey, the spokes kid from Kids Saving The Rainforest, a wildlife rescue and sanctuary in Quepos, Costa Rica. This month I am dedicating my article to a kind-hearted, sweet-souled, three-toed sloth named Monty. I am very sad to report he passed away after spending nine months in Kids Saving The Rainforest’s wildlife nursery and making a huge place in the hearts of everyone who knew him. About nine months ago, Monty was seen falling from a tree in Manuel Antonio National Park. The Kids Saving the Rainforest professional wildlife rescue team rushed to save him, and he was brought in to the KSTR veterinary clinic where he was examined by the vet, Dr. Carmen Soto. Dr. Soto was unable to find any visible injuries, and he was held for a few days under observation to ensure he would not start developing any new signs of injury or illness. At the time he fell, Monty was about six to seven months old. Hello Quepolandia readers! Its Karma Casey, spokes-kid for KSTR. I just got back to Costa Rica, and I’m ready to help you learn more about saving the rainforest! This month I will be talking to you about the Kids Saving the Rainforest wildlife rescue center, and some of the animals being helped there! First things first, every animal that comes into KSTR goes straight to the veterinary clinic. There our clinic team comes to the rescue! They determine what is wrong with the animal, and quickly do what is needed to help save them. Take for example Senor Dona, a two-toed sloth I talked about in one of my previous articles. Dona had a very bad day, getting electrocuted and then falling onto the road and being hit by a car. But luckily Kids Saving the Rainforest came to the rescue! Poor Dona used to be paralyzed from the waist down. 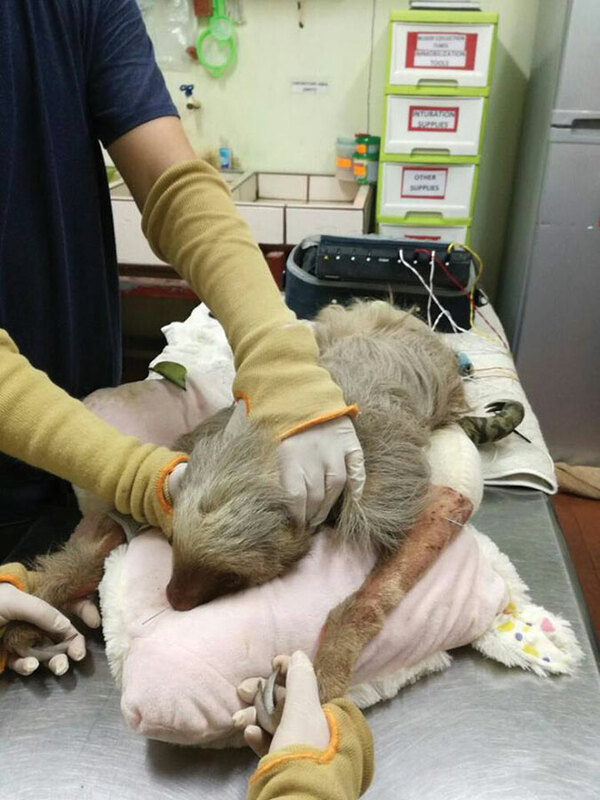 As you may have read in my other article, the KSTR clinic/rescue team have tried everything they can to help Dona, even teaming up with an acupuncturist to help this very determined sloth regain the use of his back legs. Happy New Year Quepolandia readers! It’s Karma from Kids Saving the Rainforest again. If you haven’t heard of us, we are a wildlife sanctuary and rescue center in Quepos, Costa Rica and we also plant trees, put up wildlife bridges, and help educate people on respecting wildlife! I’m the spokes-kid here. I moved all the way to Costa Rica to help animals! This month I will be telling you about new beginnings. Not too long ago, my school, Life Project Education, and I took a field trip to Reserva Playa Tortuga, a great project in Ojachal that works very hard to help little baby sea turtles with their own new beginnings, and make their way safely out into the ocean where they belong! We learned all about sea turtles, did a beach clean-up, and much more! Hello Quepolandia readers! Its Karma again, the spokes-kid for Kids Saving the Rainforest! Happy holidays from me and all the animals at KSTR! This time of year is a great time for getting together with our loved ones, and appreciating the things we have. It is also a time for reaching out and showing others how much we care about them. I love giving gifts to my friends and family! Here at the Kids Saving the Rainforest wildlife sanctuary, home to more than 50 animals we like to show the residents of the sanctuary how much we care about them. We will be making special treats and preparing a big holiday feast with fun, interactive food in our animal kitchen! Last year, I helped make popcorn and cranberry garlands for the parrots, and stuffed hollowed out coconuts full of healthy, nutritious goodies for some kinkajous and white-faced capuchin monkeys! Our sanctuary staff handed out all the yummy treats, and we all got to watch the animals have a great time enjoying their holiday feast! I can’t wait to do it again this year. Hello again Quepolandia readers! I’m Karma, the spokes-kid for Kids Saving the Rainforest. This month I’m going to tell you a little bit about our wildlife bridges. In this area, many animals are sadly electrocuted or hit by cars. To help give these animals a safe way to move around this rainforest home we share with them, Kids Saving the Rainforest works together with ICE, the electric company of Costa Rica, to put up wildlife bridges. These bridges are ropes going over the roads, giving many animals such as monkeys and sloths a safe way to cross the road without going on the dangerous power lines. We now have put up well over 100 wildlife bridges in the Manuel Antonio and Quepos area! We originally called them monkey bridges and put them up for the very special Grey Crowned Squirrel Monkeys, a species that only lives in this area. Through camera traps, we have now learned many types of animals are able to use our bridges, meaning we are helping all sorts of wildlife with this project, and not just monkeys! Sometimes it is sloths on the bottom and monkeys on the top like a two-lane highway! Hi again Quepolandia readers! It’s Karma, the spokeskid from Kids Saving the Rainforest! This month I have a very important message to share with you, and that is about the importance of boating safety and protecting the very special marine animals that share this beautiful place in the world with all of us. I learned this lesson from a graceful animal called the sea turtle! Let me tell you how it happened. Recently, my amazing mama and I were walking on the beach when we came across two lifeguards carrying something large out of the water. We went over to see what it was, and we realized it was a large Hawksbill sea turtle! There were three big gashes cut into the shell. We hoped at first that we could call one of the groups in the area that work with sea turtles to help rescue it. Unfortunately, this poor turtle was already dead and it was too late to help her. We asked one of the lifeguards named Jhonny Lopez, what had happened. Jhonny teaches surfing lessons, and he also volunteers his time as a lifeguard helping to keep everyone safe on the beach. He explained to us that the turtle had been sliced by the propeller of a boat and had washed up on shore. 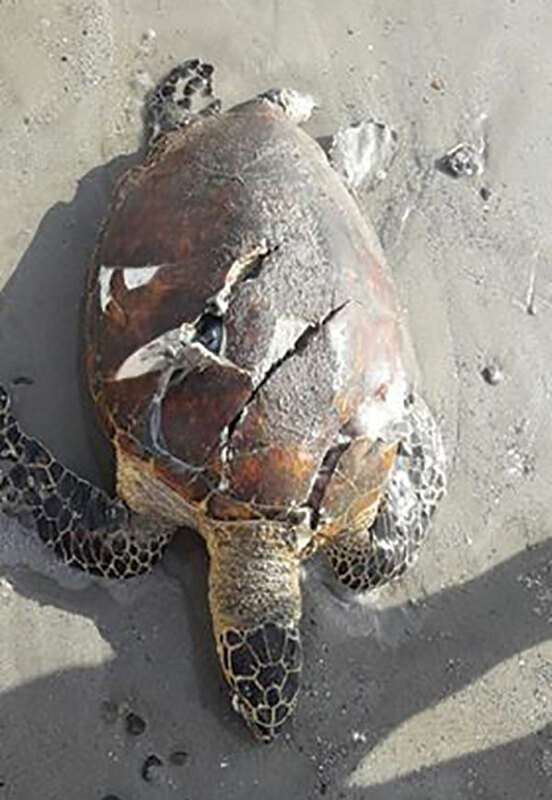 Some people were not showing any respect to the body, bothering it a lot, and he and the other lifeguard had moved it to safety while the turtle was reported to MINAE, the government agency who helps wildlife. My mama had their number in her phone, so she sent a message right away! Hello again Quepolandia readers! Its Karma, the spokes-kid for Kids Saving The Rainforest. Today, we are going to be talking a little bit about feeding wildlife, and how it affects them. You might think feeding wildlife is harmless fun, but you are actually hurting the animals and putting them in danger. Here are ten reasons not to feed wildlife you may not have thought of. Monkeys are very susceptible to diseases on human hands. They can even die from the bacteria transferred off your hand that has no effect on you. We can also get diseases from them. Migration to human-populated areas increases the risk of dog attacks, electrocutions, and being hit by cars. Abnormal feeding leads to aggressive behavior. 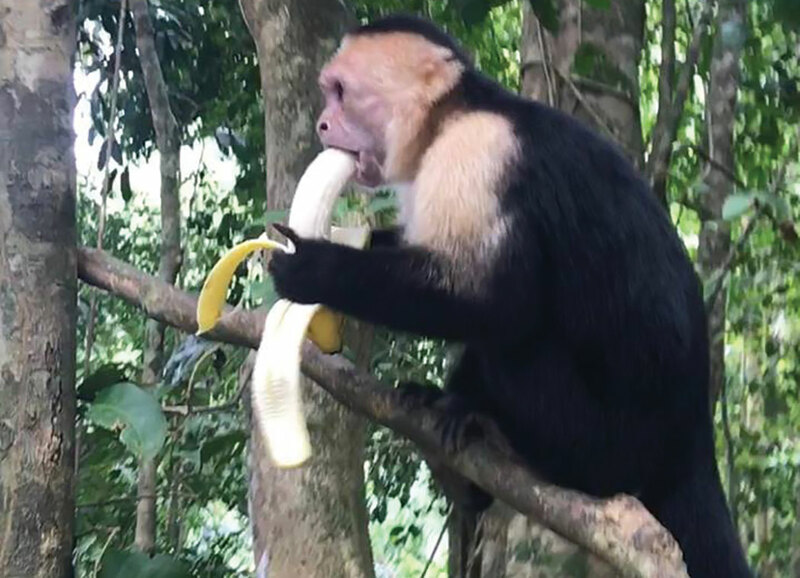 Contrary to the stereotype, bananas are terrible for monkeys! Bananas have a lot of sugar in them . The sugar leads to aggression, sugar addiction, and sometimes their teeth will even rot out! Feeding wildlife creates a dangerous dependency on humans. That diminishes the animal’s survival abilities. Their whole lives are based around finding food in the wild, and feeding them changes their habits of looking for wild foods such as seeds, insects, small lizards, and fruits growing in trees. Contact with humans facilitates poaching and the pet trade. Pregnant monkeys who are fed bananas, will not give birth to healthy babies. The babies will be malnourished, or die before birth. Monkeys need to travel an average of 17 kilometers each day to be in good physical condition. Once people start feeding them, they stop traveling for their natural foraging. Not only do we pass disease on to wildlife, but they can pass diseases to us as well. The Law of the Wildlife says that it is prohibited to feed wild animals unless they are going to die. This is the rainforest. There is plenty of food everywhere, and animals don’t need our help to get it! Hello Quepolandia readers! It’s Karma, the KSTR spokeskid again! This month I am going to be telling you about two memorable wildlife releases, and how to help animals like them. 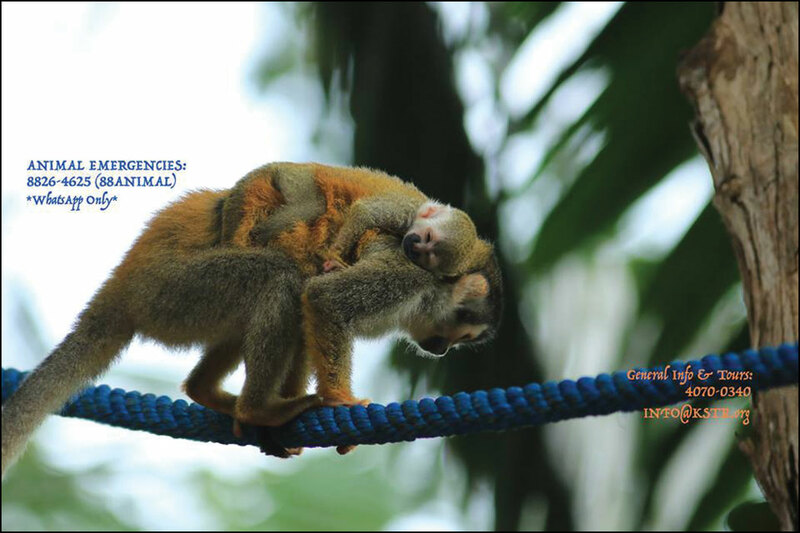 Just recently, Kids Saving The Rainforest released two Titi monkeys. Titi’s are also known as Grey Crowned Squirrel Monkeys. These monkeys live in the Quepos/Manuel Antonio area, and nowhere else in the world! We are very lucky to have them. This is the animal species we save the most of at Kids Saving the Rainforest, along with sloths, anteaters, parrots, and more! One of the Titi monkeys that were released was an adult female. We called her Elise. Once the KSTR veterinary team got the monkey to the clinic, they found out she had been electrocuted. She had really bad burns on her tail and her right leg, and damage to her head and brain. They found out something else, too: she was lactating! Lactating means that she was producing milk! If she was producing milk, that means she had a little baby in the wild! I can’t even imagine being away from my baby! While she was in the clinic, the KSTR staff & interns tried to make her as comfortable as possible, and helped her become well again. She lost her Achilles Tendon, and half of her tail was amputated. When Elise was ready for release, she was brought to the jungle where different troops were seen. She was released with high hopes that she would be reunited with her beloved baby. Hello again! This is Karma from Kids Saving The Rainforest. This month I am going to talk a little bit about our beautiful oceans! Here at KSTR, we mostly spend our time rescuing local wildlife and planting trees, but we care about the ocean too! Recently, some of our volunteers pitched in helping a beach cleanup with another great local group, Operation Rich Coast. They organize lots of beach cleanups in lots of different areas, so if you would like to help them out on their next beach clean-up follow them on Facebook at facebook.com/operationrichcoast. I am a very lucky person because I get to go to the Manuel Antonio beach almost every day! One day I was walking, and I found a piece of coral on the ground. It was white, and it still had a little bit of purple on it. I learned at my school, Life Project Education, that white coral is dead coral. I wondered, was this piece of coral being killed by something that humans had done? Happy New Year from Karma, a spokeskid at Kids Saving the Rainforest! With the first issue of the year, I wanted to reach out to our wonderful community of Manuel Antonio and Quepos and see how we can all get involved helping out Costa Rica’s wildlife! To learn about one great way to help Kids Saving the Rainforest, check out the LEAF-let we are including in this issue! You can help collect leaves for the hungry sloths, anteaters, monkeys, and other wildlife in our care! These animals need lots of fresh leaves to help give them a more natural diet. The animals in our nursery and rescue center need to learn the foods they will eat in the wild once they are released. You can help! Greetings! Karma Casey here, a spokes-kid for Kids Saving the Rainforest! You may remember me from my interview with Lexi Bacca a couple of issues ago. I moved to Costa Rica to help KSTR, and I’m 9 years old, just like Janine & Aislin when they started our organization way back in 1999. It’s that time of year again: The holidays! If you are looking for a unique gift that makes a difference, you might consider sponsoring a sloth at Kids Saving The Rainforest! 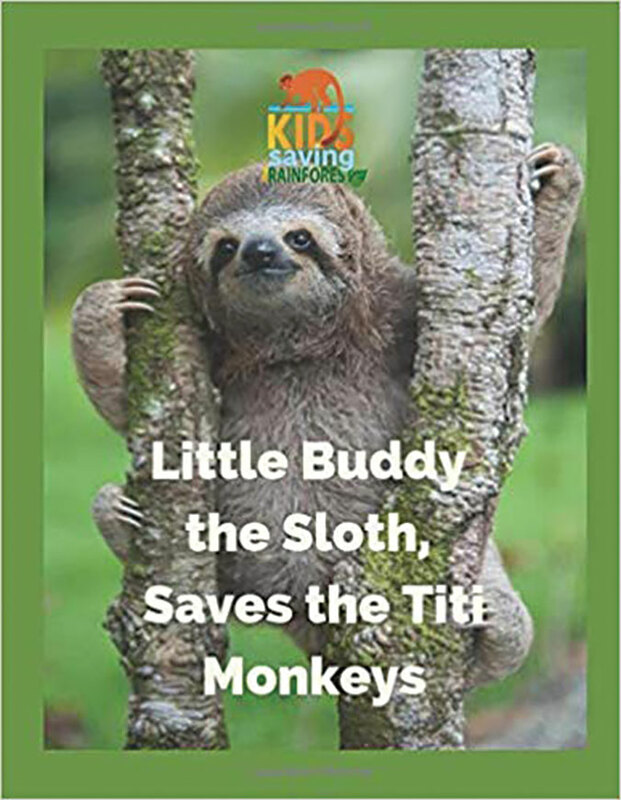 For a donation of at least $30, you will get a plush sloth, a photo and a story of a real live sloth saved by KSTR, a certificate, and fun facts about sloths! To learn more, visit sponsorasloth.wordpress.com. Although plush sloths are good to snuggle and hold, real sloths are not! They will become so stressed out they may even die. Also, it is very illegal to hold or touch wild animals. 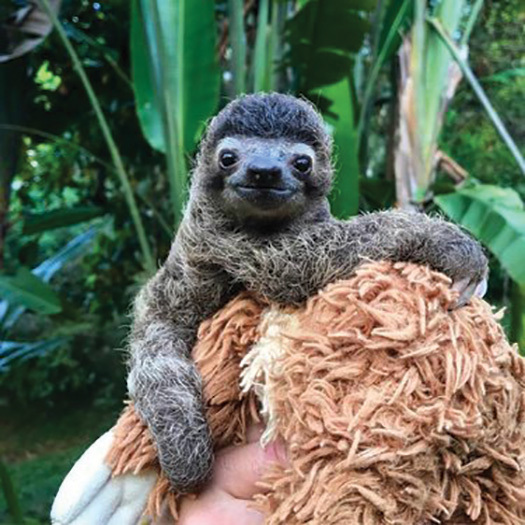 When an orphaned baby sloth comes into Kids Saving The Rainforest, they are given a plush animal to hold onto very much like the one you will receive. They cling to it like they would their mother.